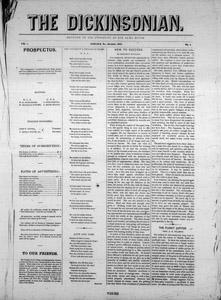 The Dickinsonian, student newspaper of Dickinson College, began publication in 1872. This online project provides access to images of the newspaper from 1872 up through 2016. While the text of the papers is not keyword searchable, summaries of each individual issue have been posted, and tags have been assigned to help identify key people or events reported in that issue. Click below to browse all issues chronologically by year, or search within the summaries using the box at right.